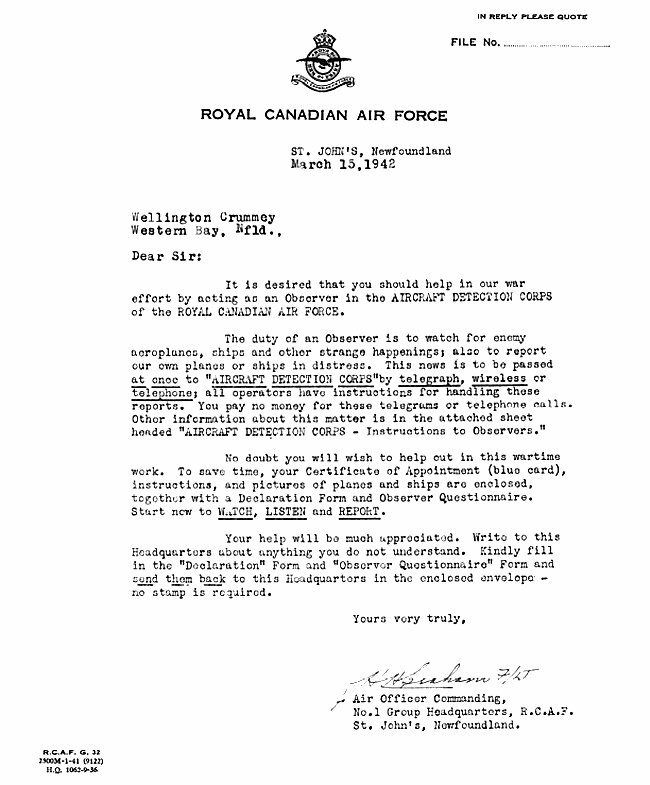 The Canadian Aircraft Detection Corps was organized in May 1940. Throughout Canada, civilian volunteers took training courses in aircraft detection. They became skilled and recognizing and identifying both Allied and enemy aircraft, and they were introduced to the various communication methods that best suited the particular area they were serving in. The civilian volunteers provided a valuable, if rudimentary, early warning system at a time when radar was not fully developed. By the end of 1943 the Aircraft Detection Corps had grown to a peak enrollment of 30,000 members across the country. On the west coast, long stretches of uninhabited coastline on the Queen Charlotte Islands were particularly vulnerable. A great many sheltered, deep-water bays and inlets existed that could serve as hidden staging areas for the Japanese naval forces. Civilians living in some of these remote areas organized an Aircraft Detection Corps and appointed their own Regional Directors and Chief Observers. Enthusiastic, patriotic volunteeers kept a vigilant duty watch to ensure that no aircraft passed their posts unreported. From Langara Island off the northern tip of Graham Island, to Kunghit Island off the southern tip of Moresby Island, housewives, loggers, lighthouse keepers, farmers and fishermen went about their daily business with a pair of high-powered binoculars slung around their neck. "The telephone system is inadequate and is more of an aggravation than a help. The early warning RDF chain is not yet in being and will not be ready until mid-summer. The Aircraft Detection Corps, although it is in operation, is not effective because it is dependent upon inadequate civil communication facilities, and upon the half-hearted, voluntary and unpaid efforts of civilian observers in isolated locations." "The service operates - but not at the hours when it is most needed. In order that it be made effective, it will be necessary to post RCAF personnel at the most isolated points on the west side of the coastal islands to augment the civilian observers. It will be the job of those RCAF personnel to improve communications." In a specific community a solitary airman can take the early morning watch and train volunteers for the day watches. Where there is no community, for example on the west side of the Queen Charlotte Islands, it will be necessary to locate detachments of four airmen." Technology progressed, and (RDF) Radar Direction Finding units were established in the most isolated and defenceless areas along the west coast, and on the coastal islands. The civilian volunteers and their ever-ready binoculars were gradually replaced by the Coast Watch Units, and eventually by the more sophisticated radar system. On 15 November 1944, the RCAF Chief of Air Staff ordered the Aircraft Detection Corps disbanded. MBE awarded to S/L SM Black - 10 January 1946. Courtesy RCAF Honours & Awards. 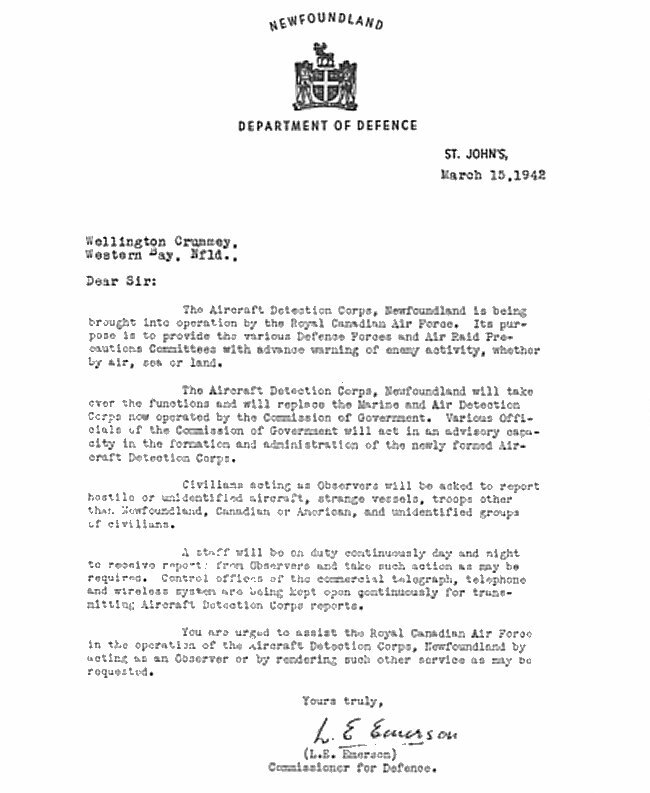 Letter of Appreciation - 23 December 1944. 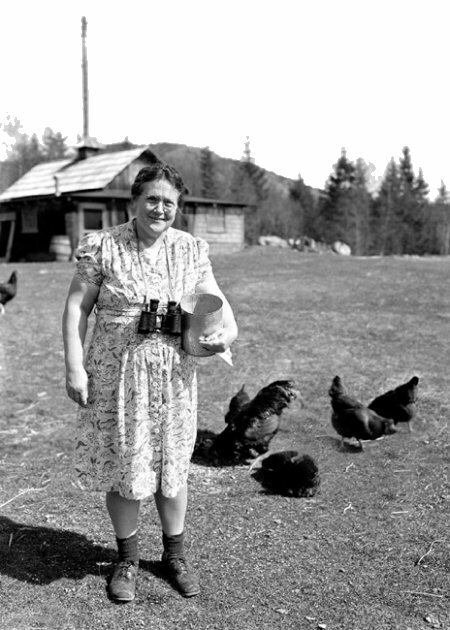 With a smile on her face and binoculars around her neck, this Aircraft Detection Corps volunteer feeds her chickens while ensuring Canada’s safety - June 1943. Courtesy National Archives of Canada PL17189. Aircraft Detection Corps lapel button - 1943. 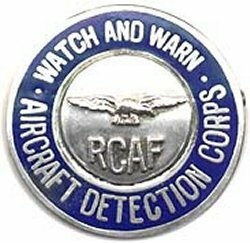 RCAF World War II Aircraft Detection Corps enamelled badge. Sterling silver and blue enamel. Vaulted center disk with flying eagle, letters RCAF below. Words: "Watch and Warn" above. Hallmarked by BM Co.(Sterling). A letter to Mr. PW Crummey of Western Bay, BDV, Newfoundland from LE Emerson, Commissioner of Defence for Newfoundland - 15 March 1942. A letter to Mr. PW Crummey from F/L HH Graham, Officer Commanding No. 1 Group RCAF St John's - 15 March 1942. 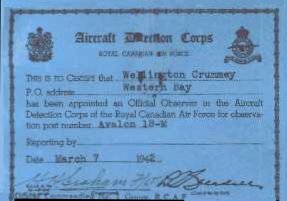 RCAF Aircraft Detection Corps wallet certificate of appointment - 7 March 1942. Issued by F/L HH Graham. General Information on the Aircraft Detection Corps - 1942-1944. 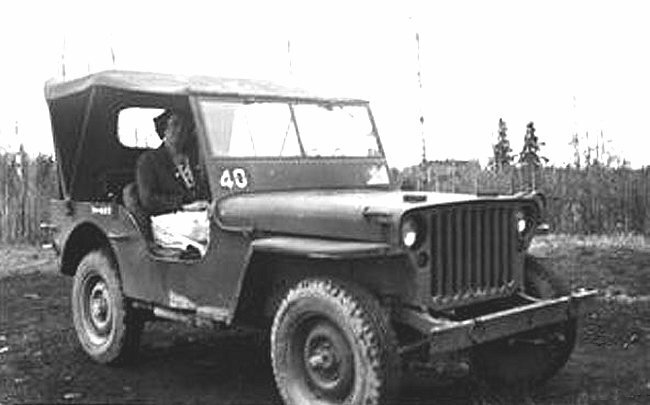 Eleanor Grainger in a jeep with her binoculars at Nadina River, BC - 1942. She was an "Air Warden" attached to the Aircraft Detection Corps during World War II. She had a book of aircraft profiles and one of the only telephones in the area and reported on any aircraft that flew over the area to a central comand post. Pilots in those days used Nadina Mountain as a navigational aid just they do today since it is such a prominent feature in the area.